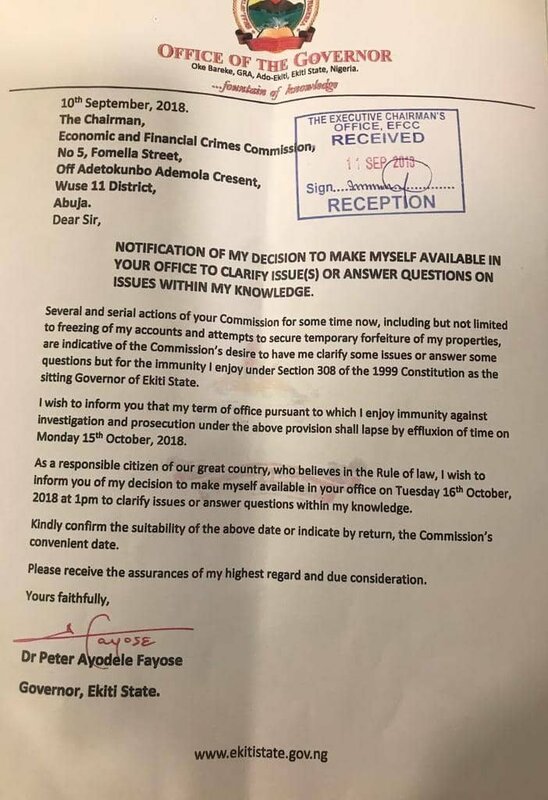 The Economic and Financial Crimes Commission (EFCC) has replied the Governor of Ekiti State, Ayo Fayose on his request to report to the commission on October 16 to clarify issues on his alleged financial misdeeds. It advised the Governor that he can brush aside his immunity and report on September 20, weeks before the October 16 date since he is desirous to sort out issues regarding the freezing of his accounts and other allegations by the Commission. Magu’s four paragraph letter read in part “I appreciate your sense of duty and responsibility as a law abiding citizen who wishes to submit himself voluntarily to the due processes of the law, more so as your immunity as a governor shall soon come to an end. “In view of the above, and your request to make yourself available on Tuesday the 16th of October , 2018 to make clarifications on ongoing investigations that affect you, we look forward to receiving you even earlier than the 16th of October, 2018. “In this regard we shall be willing to receive you on Thursday 20th September,2018 without prejudice to your immunity under Section 308 of the Constitution of the Federal Republic of Nigeria, 1999”. 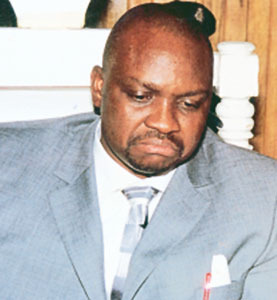 Fayose had on September 10 written the Commission and expressed willingness to appear before it to clear his name on some controversial issues bordering on alleged corruption. The Governor’s letter read in part: “Several and serial actions of the Commission for some time now including but not limited to freezing of my accounts and attempt to secure temporary forfeiture of my properties are indicative of the Commission’s desire to have me clarify some issues or answer some questions but for the immunity I enjoy under the section 308 of the 1999 Constitution as the sitting governor of Ekiti state. Meanwhile, Governor Fayose, yesterday signed the 2018 supplementary budget of N9.9bn into law. Fayose at the event graced by Speaker Kola Oluwawole and some members of the Ekiti State House of Assembly, chided the All Progressives Congress and the Governor-elect, Dr. Kayode Fayemi, for raising questions on the budget. Accusing President Muhammadu Buhari-led APC of taking hypocrisy to a ridiculous height in governance, Fayose said he had acted within the law by sending the budget to the assembly for appropriation and that what he was doing was for the benefit of Ekiti people.